Frozen Yogurt Fruit Bars – Nutrition.Health.Life. When I first saw these frozen yogurt trail mix bars over at The Lean Green Bean, I knew I had to make them. J and I love, love, LOVE frozen treats. I wanted to finish that sentence with “in the summer” but realized that we really just love them all the time. I whipped a quick batch together during my 3 hour CSA food prep marathon last Tuesday. We got a pint of fresh raspberries in the CSA and I knew I had to act quick, or else they would be gone before I got around to making the bars. We didn’t have any granola on hand, so I first had to throw that together. I used this simple recipe as a guide and just crumbled some of the bars for granola. I also didn’t use Greek yogurt because I had non-fat on hand. These turned out really good, but I’m sure they weren’t as good as the real thing – fat free dairy gets very icy in the freezer, where yogurt with a little “junk in the trunk” will be nice and creamy. In a large bowl, mix the two yogurts together. Add raspberries and 1/2 the granola. Prepare a baking sheet with aluminum foil. Pour mixture on the foil and spread to be 1″ thick. Top with remaining granola. Place pan in the freezer. After an hour or two, remove from freezer and check how frozen the bars are. Our freezer wasn’t super cold, so they were still a little soft. I used this as an opportunity to score them, making it easier to cut later. Return to the freezer until solid. Cut into bars and place bars into a freezer container. Store in the freezer. Place honey, molasses, and peanut butter in a pan and slowly heat. Stir constantly. Bring to a light boil and reduce heat, continuing to stir. Add almond extract and cinnamon; stir well. Add oats and almonds; stir well and remove from heat. Firmly press into a lightly greased baking pan and let cool. To make them crunchier, bake for 20 minutes at 350F. 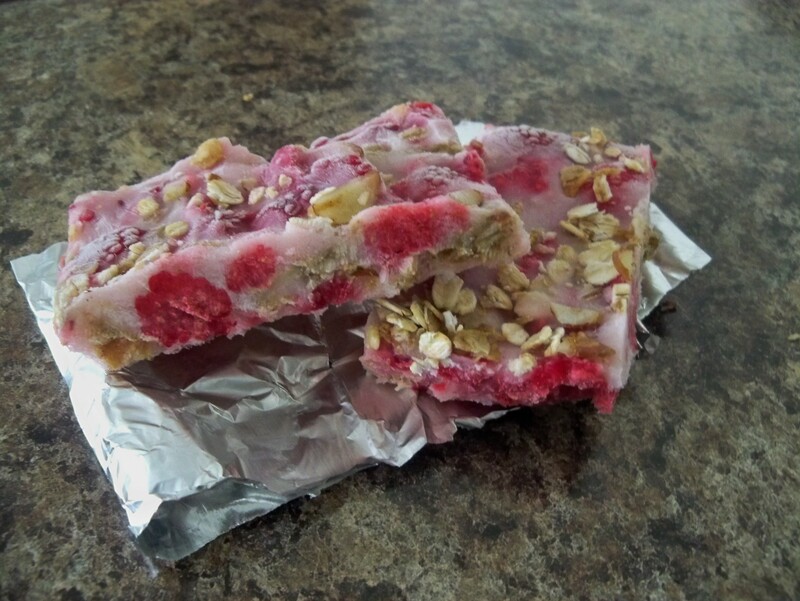 This entry was posted in Nutrition and tagged desserts, frozen treats, fruit, nuts, summer. Bookmark the permalink.